A couple of months ago, my boyfriend and I went to Amsterdam for a five day holiday to get away from work stress and flat-searching problems. Amsterdam certainly did the trick to take our minds off worries back in England. For me, it was mostly because, without realising, we had stumbled upon bookshop heaven! 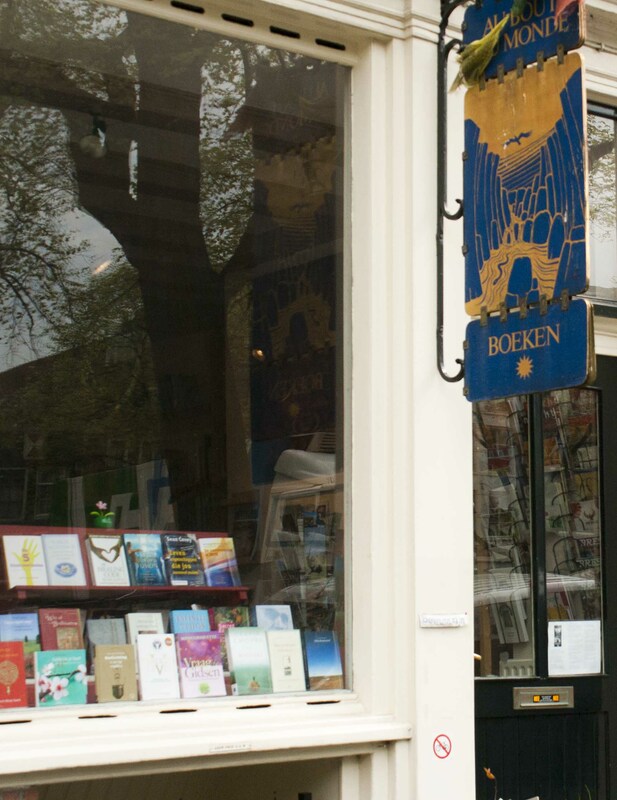 In the middle of the week we took a walk along the Singel canal and to my pleasure found THREE bookshops in a row. I could not believe my luck! We walked up the stairs to the first bookshop to find a very calming atmosphere – the perfect shop to put all our worries behind! The shop is large and well lit, with tall green plants and impressive vases filled with tulips. 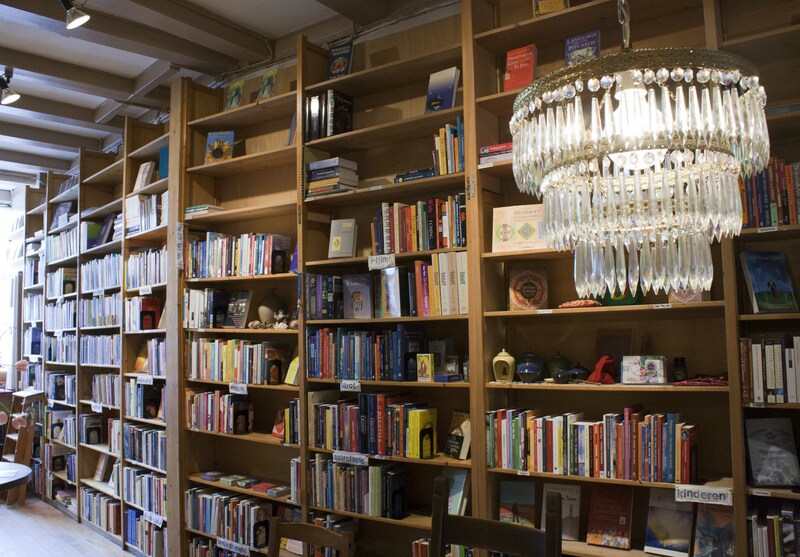 The books – and there are a lot of books – are displayed neatly on floor to ceiling wooden shelves and wooden tables. The wooden floors, interesting posters and plants give a feeling of peace and relaxation. 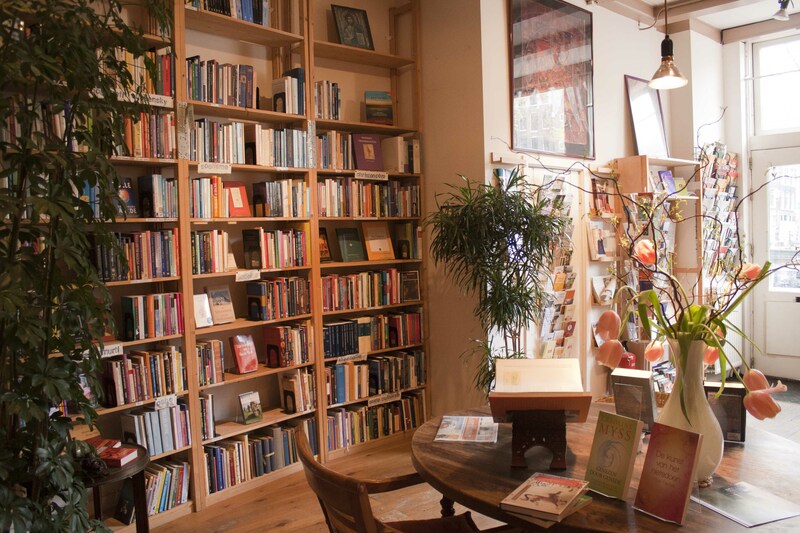 Au Bout du Monde is a ‘wisdom bookstore’ specialising in spirituality. Taking a closer look, I noticed all different types of subjects; religion, philosophy, poetry, meditation, self-evaluation, art, nutrition and health. Many of the books were very intruiging, and although it’s not my usual subject of interest, I found myself getting quite engrossed! 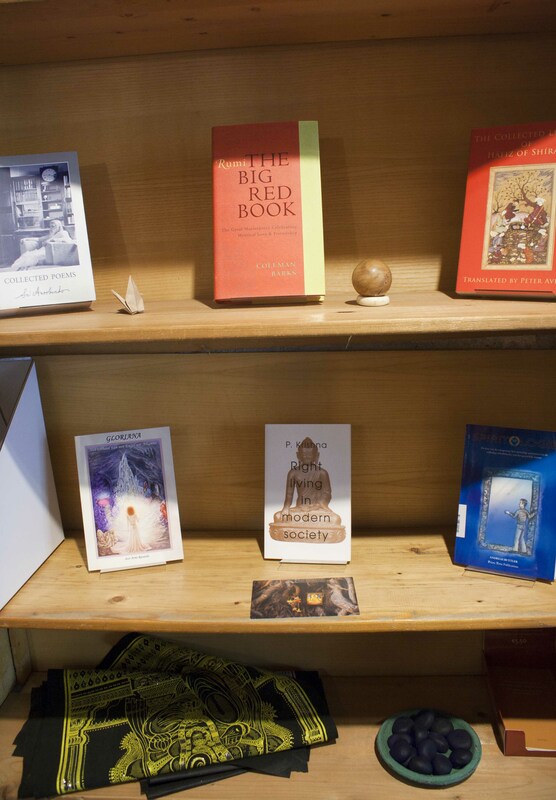 The books were displayed wonderfully, with ornaments mixed in to add to the spiritual effect. I even saw some tarot cards on one shelf! Towards the end of the shop there was a long wooden table. At one end, I found an interesting display of books. My boyfriend spent some time reading Zen Buddhism: A History. The chairs on either side of the table were very inviting and I felt as though I could have hung about all day, leafing through books. In fact, at the end of the table, a man and woman looked as though they had been hanging about all day, drinking cups of green tea and discussing… well I’m not sure what they were discussing, as it was all in Dutch, but it sounded very in depth! As I approached the table, the man, who I assume runs the shop, offered us some tea. Wow, a bookshop that offers free tea! Now that’s something all bookshops should take up! We had a brief chat, but sadly no tea as we were in a hurry to get to the other side of Amsterdam – and there were still two more bookshops to explore! I was sad to leave, because this bookshop had so such a lovely atmosphere and I can imagine some very enlightening discussions too! Taking a look at the leaflet that I was handed by the tea drinking man, Au Bout du Monde is described very accurately: ‘A beautiful place to calm down, have uncommon conversations, enjoy free tea and coffee and be naturally inspired.’ I would have liked more time to spend browsing the shelves and will have to remember it for another time! If this sounds like your kind of place (free tea and coffee – how can it not?!) 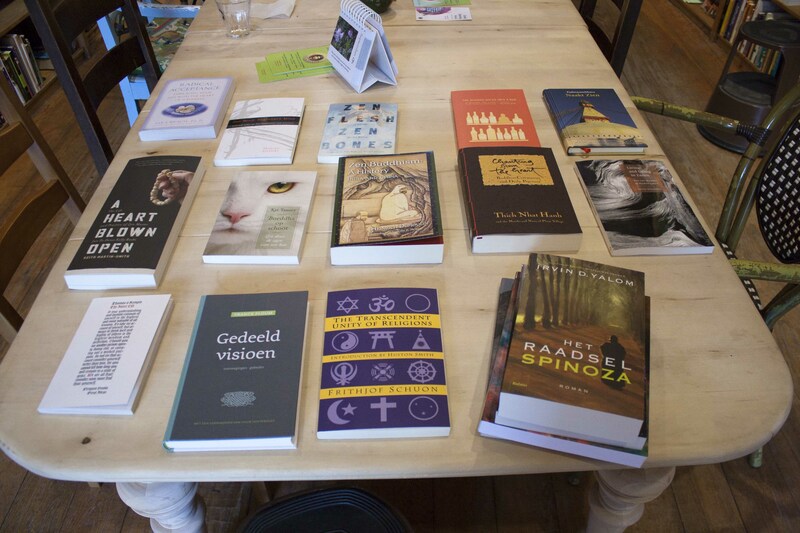 here’s the address: Singel 313, 1012 WJ Amsterdam. (tel: 020 – 625 13 97) and for more information, take a look at their website. I’m off on a stag weekend soon, and now I know I can indulge my book buying I am looking forward to it even more. This has made my Sunday! That’s great! Thanks! 🙂 Have a great weekend! Wow, what a great place. Great post too! When I went to Amsterdam, it was incredible. Loved it. I strayed into a few bookstores – most of the time, it was raining in the evenings, so a good book was needed! – and I found Amsterdam so wonderfully cultured. I found a store that sold just old postcards, which might sound a bit boring, but to see all that history – and all that art – displayed in front of me was fantastic. This place sounds wonderful, but I may have to avoid for now. After my last trip I’ve sworn off buying new books. I accidentally verbalized this and I know I’ll be held to my word. Good think I have a mini library in my home. Oh no! My pile of unread books seem to be getting bigger every day, so I should probably do the same. People keep giving me books and I keep buying them, I feel as though I’ll never be able to read them all, but I can’t stop! It seems so sweet in there like you could meditate just sitting on the floor with a book. I love the flowers in the vase on the table. I just adore when bookstores add personal touches to be different from other bookstores. Lovely, thanks for sharing. Thanks for the comment! Yes, it does have that something extra because of the personal touches. It’s definitely worth visiting if you are ever in the area!